We’re at the Rapid Excavation and Tunneling 2015 (RETC 2015) Conference, in New Orleans June 7-10. 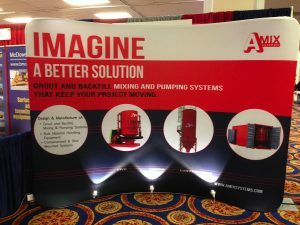 Visit AMIX Booth 1100 for high performance grout mixing and backfill systems. RETC 2015 conference exceeds 1,400 professionals from more than 30 countries.Industries. Sectors include construction, mining, geotechnical engineering, exploration, environmental, economics, manufacturing, government, land, water/wastewater and transportation. We are looking forward to the meeting up with everyone at the conference and checking out the comprehensive exhibits, short courses, field trips, and tours! Dennis Arbour, President and GM here at AMIX, and Waco Merchant, our Grout and Backfill Mixing System Specialist will be in our booth. Join us in the booth to discuss your specific project needs and to learn more about how we can help. High-output, low maintenance grout mixing and backfill systems that just work, so you can spend more time producing. AMIX is located in British Columbia, Canada and designs and manufactures grout and backfill products with over 20 years of experience standing behind them. Our equipment is used in mining and heavy civil markets. We are committed to solving the difficult problems companies face with grout mixing projects. It begins with listening to and understanding project requirements and site-specific concerns. It’s the straightforward simple designs that are the big difference with AMIX products. Our grout mixing plants are built using modular design principles with a focus on ease of use and scalability. Utilizing clean and simple mill configuration it has less moving parts. The plants and batch systems produce high outputs while maintaining a low carbon footprint. 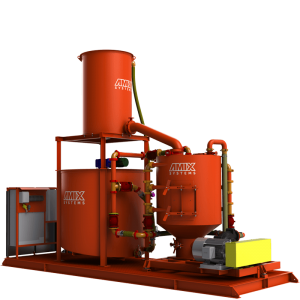 AMIX is dedicated to bringing the advanced technology of our Amix Colloidal Mixer to Civil and Mining projects worldwide. We know what it takes to build equipment that performs to spec. Simple turn-key solutions or complex custom equipment, our team has the knowledge and skill to get the job done.